Developers and app designers have tons of ideas to portray while making an app. They make sure that all the elements are well presented and rehearsed so there remains no confusions, they also prepare themselves for the malfunctions created by the application and plan to put forward the ways to overcome the glitches that occur within the app so to provide a good user experience. Application’s interface has to be user friendly, usually game apps are full of life, colors and flamboyance therefore gamers get attracted to the apps and get to download them so quickly. However then there are apps of wallpapers, photo/video, entertainment related apps, books and business, education, finance, food and drink apps, health and fitness apps, musical or medical apps, magazines/ newspaper apps, shopping and socializing apps, travelling apps, weather and references apps etc. 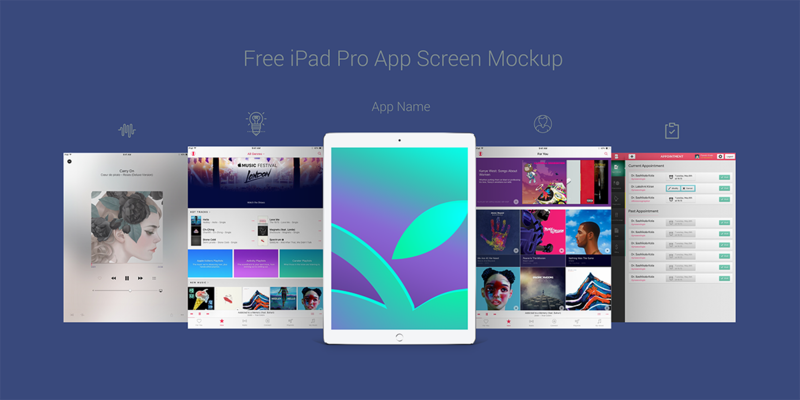 and in order to display them in a presentation to your client you can also take the help of a mockup, check out this free iPad App design mockup PSD. Place the application user interface into this iPad mockup and it is all set to be presented in a professional way to your client. He will have the fair idea that how his application will look like in the actual form inside the iPad. Presentation making is the key to get the approval of the clients, so make sure you do it in a good and sensible way. For more amazing and interesting collection of art, design and tech, stay tuned to us and we will keep on updating you about the latest and trendy design stuff from all over world, we also give shout outs to the artist of the month and this gives an inspiration to the learners who want to start up their career in graphic design. Don’t forget to subscribe to our blog and get the daily prompts of design. Here we go with a bang to come right back again.